Atlantic Division Champions for the 2017-18 season, the Lehigh Valley Phantoms (47-19-5-5, 104 pts. 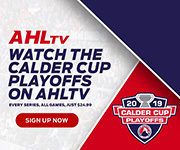 during the regular season, 7-2 in 2018 Calder Cup Playoffs) continue their quest for the 2018 Calder Cup Championship this week as they begin their Eastern Conference Finals series with the Toronto Marlies. 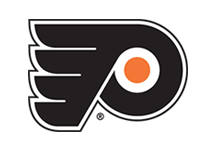 In the midst of their 12th postseason appearance in franchise history, this is the Phantoms first trip to the Conference Finals since 2005. 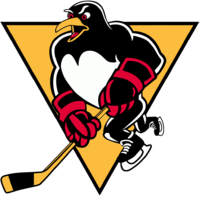 The top seed in the Atlantic Division portion of the 2018 Calder Cup Playoffs, Lehigh Valley opened its playoff run by eliminating the fourth-seeded Providence Bruins in four games (3-1) before ousting the third-seeded Charlotte Checkers in five games (4-1) in the Atlantic Division Finals. Meanwhile, Toronto (54-18-2-2, 112 pts. during the regular season, 7-2 in 2018 Calder Cup Playoffs) earned the top seed in the North Division and eliminated the fourth-seeded Utica Comets in five games (3-2) before sweeping the second-seeded Syracuse Crunch (4-0) in the North Division Finals. As the highest seed in the 2018 Calder Cup Playoffs, Toronto has earned home-ice advantage throughout the postseason and will host Games 1 and 2 of the Eastern Conference Finals at Ricoh Coliseum this Saturday, May 19 and Sunday, May 20, respectively. Both games are scheduled to begin at 4:00 p.m. The best-of-seven series will then shift to PPL Center in downtown Allentown for Game 3 on Wednesday, May 23, Game 4 on Friday, May 25 and, if needed, Game 5 on Saturday, May 26. 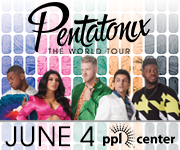 Tickets for all three games at PPL Center are available now by clicking HERE. If needed, the series will then head back to Toronto for Game 6 on Monday, May 28 and decisive Game 7 on Wednesday, May 30. Phantoms fans are encouraged to head to Chickie’s & Pete’s at PPL Center for the team’s official Playoff Watch Party for Games 1 and 2 this Saturday and Sunday with food and drink specials set to begin at 4:00 p.m.. The Eastern Conference Finals is set to pit the top two teams in the entire 30-team American Hockey League against one another. The Marlies finished the 2017-18 regular season with a league-leading 112 standings points while the Phantoms were second with 104. What’s more, Toronto paced the AHL with 54 wins this year while Lehigh Valley was second with 47 victories. No team in the AHL won more home games this season than the Phantoms (27) while no AHL club had more road victories this year than the Marlies (30). Lehigh Valley posted a 0-1-1 record in two regular season meetings with Toronto falling in a 5-1 decision at PPL Center back on November 5 before earning a standings point in a 3-2 shootout tilt at Ricoh Coliseum on January 15. 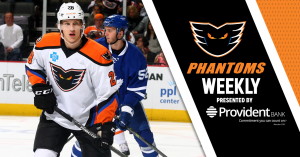 The Phantoms and Marlies have faced off just eight times over the last four seasons with Lehigh Valley having posted a 4-2-2 mark in eight head-to-head clashes with Toronto. 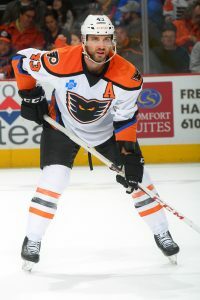 Forward Chris Conner currently leads all Phantoms in postseason scoring with eight total points (4 goals, 4 assists). The 34-year-old winger tallied a pair of goals in three road games in Charlotte last week. Forwards Danick Martel (right) and Oskar Lindblom are currently tied with Chris Conner for the team lead with four goals scored this postseason. Both Martel and Lindblom have tallied seven total points (4 goals, 3 assists) in these playoffs. Lindblom is currently tied for third among AHL rookies in postseason scoring. Goaltender Alex Lyon has been exceptional in the 2018 Calder Cup Playoffs for Lehigh Valley. The second-year netminder was 4-0 against Charlotte in the Atlantic Division Finals with a 0.73 goals-against average coupled with a 0.979 save percentage. Overall in the 2018 Calder Cup Playoffs, he’s 6-1 with a 1.49 goals-against average and 0.959 save percentage. Defenseman T.J. Brennan (right) currently leads all Phantoms with 59 career AHL postseason games and 43 AHL postseason points (18 goals, 25 assists). Meanwhile, Conner is second with 48 career AHL postseason appearances and 33 playoff points (12 goals, 21 assists). 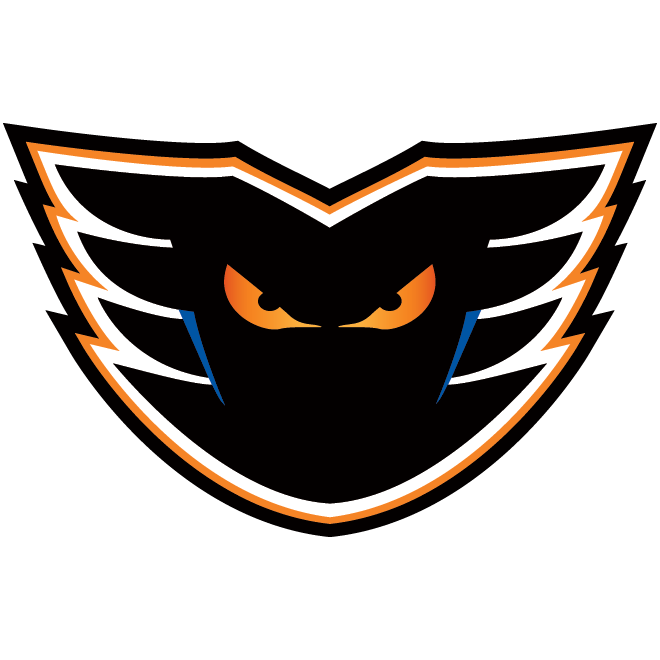 The Phantoms’ power play is currently fifth among all AHL playoff clubs at 19.4 percent (6-for-31). Meanwhile, Toronto’s man-advantage is third overall at 20.8 percent (10-for-48). Lehigh Valley went 42-1-5 when scoring three or more goals during the regular season and is 5-1 in the postseason in that circumstance. 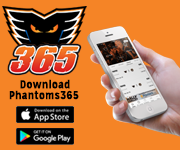 Meanwhile, the Phantoms went 41-6-5 when allowing three goals against or fewer during the regular year and are 7-0 in such games in the playoffs. In fact, in each of the team’s four victories against Charlotte in the Atlantic Division Finals, Lehigh Valley limited the highest-scoring team during the regular season to just a single goal in each game. 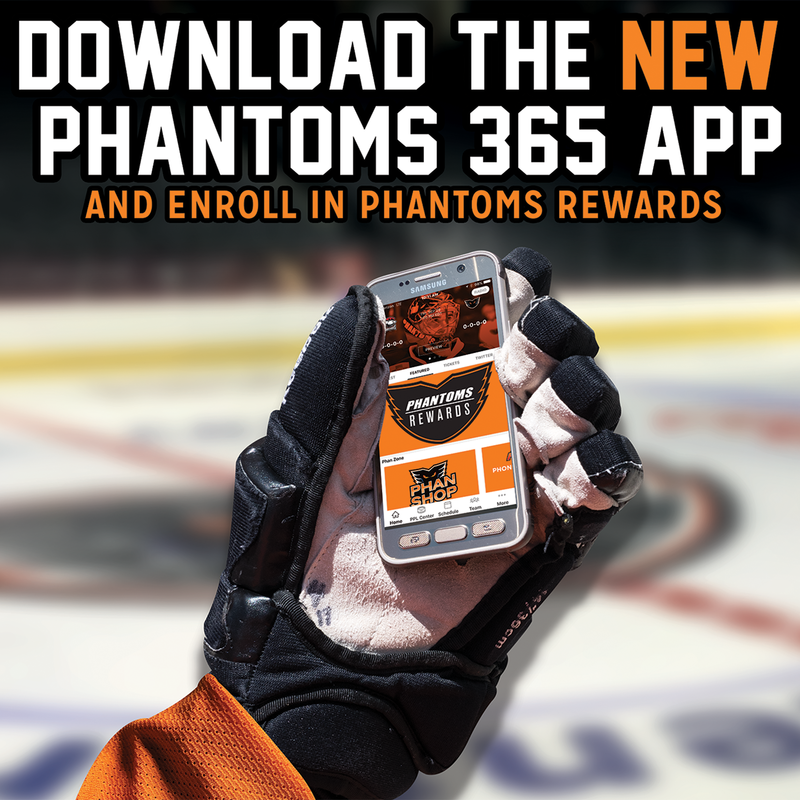 The Phantoms were 30-4-6 when scoring first during the regular season and are 5-0 when netting the game’s opening goal in the playoffs. Meanwhile, Toronto was 36-6-2 when scoring first during the regular season and is 6-0 when doing so in the playoffs. 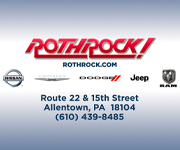 Lehigh Valley was 19-4-10 in one-goal contests this year and is also 4-0 in one-goal tilts this postseason. The Marlies were 15-4-4 in one-goal games during the regular season and are 3-0 in the playoffs. 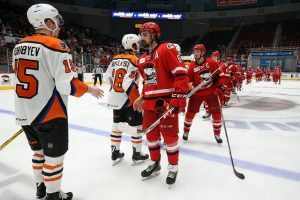 Oskar Lindblom (3rd, 4th) scored twice and Greg Carey added a pair of assists as the Phantoms earned a convincing 5-1 victory over the Charlotte Checkers in front of 4,822 fans inside Bojangles’ Coliseum in Game 3 of the Atlantic Division Finals. With the win, the Phantoms claimed a two games to one edge in their best-of-seven series with the Checkers. Mike Vecchione (3rd), Danick Martel (3rd), and Chris Conner (3rd) rounded out the scoring for Lehigh Valley in front of goaltender Alex Lyon who backstopped the win as he turned aside 34 of Charlotte’s 35 total shots. 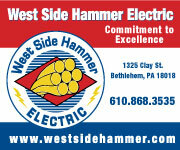 All told, 11 different Lehigh Valley skaters recorded at least one point in securing the triumph. 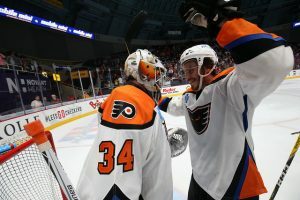 Alex Lyon registered a franchise record 94 saves and Alex Krushelnyski netted the game winner 6:48 into the fifth overtime as the Phantoms claimed the longest game in American Hockey League history with a 2-1 win over the Charlotte Checkers in Game 4 of the Atlantic Division Finals. With the win, the Phantoms grabbed a commanding three games to one lead in their best-of-seven series with the Checkers. 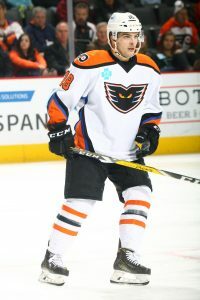 Danick Martel (4th) scored in regulation for Lehigh Valley in a game that lasted six hours and six minutes and required 146:48 of game action to decide. All told, the Phantoms and Checkers combined for 148 shots on goal while Lyon (94 saves) and Charlotte netminder Alex Nedeljkovic (51 saves) combined for 145 total saves. Five different Phantoms found the back of the net and goaltender Alex Lyon capped a sensational series between the pipes with 27 saves on 28 Checkers shots as the Phantoms downed Charlotte 5-1 in Game 5 of the Atlantic Division Finals. With the win, Lehigh Valley claimed the best-of-seven series four games to one in earning a trip to the Eastern Conference Finals for the first time since 2005. Chris Conner (4th), Phil Myers (2nd), Corban Knight (1st), Tyrell Goulbourne (1st), and Colin McDonald (1st) all scored in decisive Game 5 as the Phantoms improved to 4-1 on the road this postseason. Lyon turned in a herculean performance in the Atlantic Division Finals going 4-0 with just four goals against (0.73 goals-against average) while posting a 0.979 save percentage (184 saves on 188 shots).